In late summer of 2016, the FOUND:RE will open its doors and it's promising to bring something new and exciting to downtown Phoenix. The 105-room boutique hotel is being developed by Habitat Metro and BOND Partners and will be managed by Urban Quarters Hospitality, with a goal of fully embracing the Phoenix art community and local culinary artisans and purveyors. 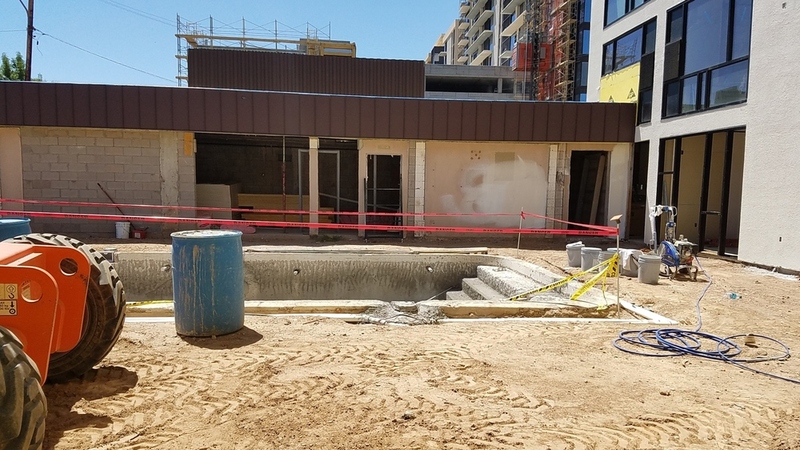 Our media group gathered for a recent hard-hat tour as Parley Stock, Director of Sales and Marketing, gave us a little background on the property and what it aims to bring to the downtown Phoenix scene. "There are three components," he explained. "Local design, local art, and locally-sourced ingredients in chef’s great food." This same reverence for community is exemplified in Executive Chef Akos Szabo's plan for MATCH Cuisine and cocktails. We learned his commitment involves bringing the team to visit Arizona purveyors, such as recent trips to Blue Sky Organic Farm, Crow's Dairy, Zak's Chocolates, Serenity Salted Sweets, Danzeisen Dairy, and Abby Lee Farms. "I want everybody to be connected because it’s a chain of energy," Chef Akos said. "The farmers work so hard in creating a product, the delivery guy delivers it to us with a smile, we cook it with a smile, and then you eat it and it's just so good. You never want to break that connection." For Chef, it's of primary importance that everyone interacts with the farmers and artisans on a personal level to develop these valued relationships. "I’ve never seen a team where it’s everyone from the GM to marketing, social media, and everything in between going out to meet these farmers and going out on these tours," Tatum noted. "Where others at this stage may be meeting distributors, we're meeting artists and going to dairy farms," Parley added. "This is what we'll show you today on a raw scale." Our next stop was the lobby, which will be anchored by a unique floating check-in desk suspended by chains. Interactive art is an important design element. There will be a motion detector projected onto the floor and as guests step into the FOUND:RE, art beneath their feet will flow, such as a puddle of water rippling outward. "It can change by the season, by the day, or even by the hour," added Art Curator Mike. Outside, there will be an art display space that can be viewed from the street along with moving artwork projected on the tower. The hotel also boasts a convenient location next to the Light Rail. “People can get to us from the airport for $2. I’ve done it, it’s really easy," said Parley. The name FOUND:RE originated from the concept of a metal-forging foundry which aligned with the industrial design of the hotel. "We decided early on that we didn’t want to go with the traditional spelling since we're not your usual hotel," Parley explained. "It's a play on the wound found, and we came up with the tagline Find Yourself, about the sense of discovery we want you to have at the hotel.” "And RE is a playful spin on repurpose, recycle, refresh," Chef Akos added. We then were shown the large indoor/outdoor bar space with street access that leads into Match Cuisine & Cocktails. Chef Akos pointed out the wine storage being constructed. "Probably 80% of the wines will be local, from Pillsbury to Dos Cabezas." The 22-foot chef's counter was a brilliant idea added after the original blueprints were drawn up. It will seat up to ten people and guests will be treated to courses on the nightly menu along with specials, all paired with Arizona wine. "Think of a chef’s table inside the kitchen meets teppanyaki meets sushi bar," described Chef Akos. "The chef will cook and plate right in front of you and tell you about the ingredients and where they are sourced. For us, everything has a story attached to it and to an experience." Chef also explained how the name MATCH is a nod to “lighting a match and the artful process of burning raw fuel, such as wood.” The focal point of the gleaming new kitchen is a wood-burning oven affectionately known as Isabella and a wood-burning Santa Maria-style grill that lowers so that food can be cooked in the embers. What makes his menu even more impressive is the lofty goal of melding the flavors of global street food with seasonality and local sourcing. "To create global street food is one thing, but to do it supporting Arizona, trying to keep as many Arizona dollars here, and supporting farmers is another," recognized Chef Akos. "But our menu is almost 93% local, so we’re doing it. We’re a slow food restaurant, we’re organic, we’re non-GMO, we’re local. You can’t go wrong with what’s in season." Next on our tour, we crossed the pool area which is connected to the Studio - a space that can be used for art displays, an artist's studio for First Friday art walks, or private events. The hotel will have 105 rooms with one room converted into a small gym. Edgy urban details include concrete floors, exposed ceilings, reclaimed wood and distinctive furniture designed by Phoenix-based companies such as URI and Bang Bang Designs. Rooms will serve as the canvas for the custom art which will bring colorful accents and soften the industrial decor; pictured here is a preview of artist Linda Ingraham's work . You'll find giclée or prints (the original will be displayed in the lobby gallery area) and all will be available for sale. Look for unique amenities such as dual-use vanities that can be accessed from inside or outside the bathroom, and iPad touch tablets from which you can order room service, buy hotel art, and research downtown Phoenix activities. Parley described FOUND:RE as both a "hometown hotel and restaurant" showcasing Phoenix' cultural riches, yet "not your usual hotel" with its many surprises. It's evident this philosophy is being embraced successfully. “We want to create a sense of community, bringing people together, and also a sense of discovery, showing people what they didn’t even know they were missing. ” I can't wait. The FOUND:RE is located at 1100 N Central Ave, Phoenix, AZ 85003.